Just to let you know a little more About Us…. CW Mill Equipment Co. was established in 1969 as an agricultural equipment manufacturer. The need for live hydraulics on trucks led us to manufacture hydraulic clutch pump mounting kits in 1986. Located in the small Northeast Kansas town of Sabetha, we are able to maintain a high quality employee base with downhome values. 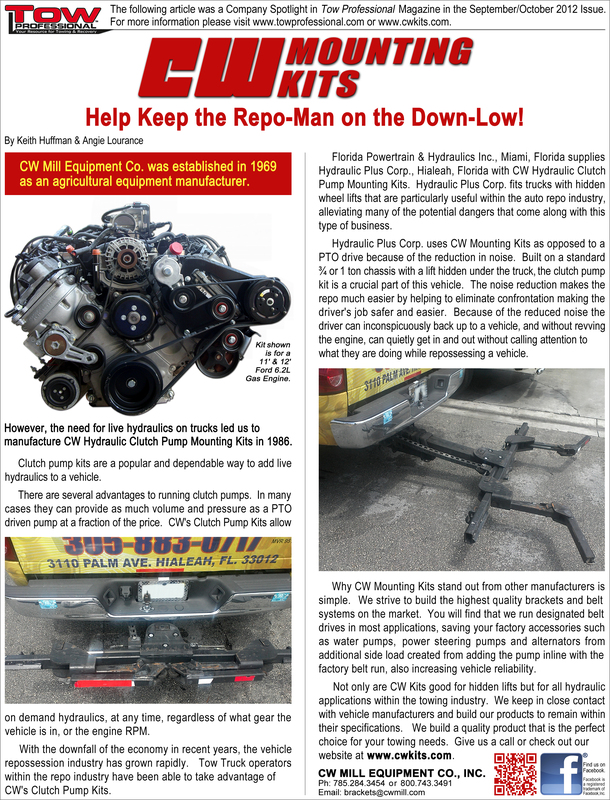 CW Mill Hydraulic Mounting Kits equip a vehicle with live hydraulics, which means they can have hydraulic pressure anytime the engine is running, regardless of engine RPM’s or gear selection. CW’s Mounting Kits can be used for a wide array of applications such as salt spreaders, snow plows, dump bodies, ground probes, airplane deicers, cranes, wreckers, rollbacks, hydraulic air compressors or tools…. 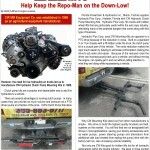 CW Mounting Kits fit most 3/4 and one ton trucks built after 1985, most gas engine vans and many medium duty trucks. CW also manufactures Compressor Kits for refrigeration truck boxes and Alternator kits which provide increased battery charging for vehicles equipped with an increased amount of DC electric powered accessories. Generator kits are available for vehicles adding AC power capability for items such as electric power tools but ultimately any AC powered device.